"The trigger for the 9-11 activity was the imminent and unstoppable Worldwide financial collapse which can only be prevented temporarily by a major war, perhaps to become known as World War III. To bring it off one more time, martial law will probably be imposed in the United States." In 1910 US government debt stood at about $1 billion or about $12 per citizen. Now, its about $15 trillion (all levels of government) or about $50,000 per citizen owed to the private owners of the Federal Reserve Bank. Government and corporate debt is inherited. Therefore, whenever we pay taxes or buy corporate products, we pay homage to the Illuminati owners of the private central banks because part of our money goes to pay interest to them on money which they created from nothing, through the power that was given to them by fraudulent legislation. The total amount owed by consumers, businesses, governments and financial institutions totaled $34.4 trillion at the end of 2003, according to the Federal Reserve. The economy produced $11.3 trillion of output. That makes the nation's debt triple its gross domestic product. In 1933, debt was about 2 1/2 times GDP, according to a study by the Gabelli Mathers mutual fund. In 1694, the English government’s debt to the private owned Bank of England was £1.25 million. In 1993, (11 years ago) the British taxpayers paid £24.5 billion alone in interest, more than twice that in the education budget! And who knows what the real figure is, since many things are kept secret. When this pyramid collapses, we would suddenly be in a very different World. In 1929, the stock market crashed, but the gold standard held. The monetary system held. Now, we are dealing with something that's more fundamental. The only precedent I know of is the Roman Empire collapse, which ended Roman currency. That was, of course, at a time when it took about a century and a half for the breakdown to spread through the empire; now it would take a few hours. "To expose a 15 Trillion dollar rip-off of the American people by the stockholders of the 1000 largest corporations over the last 100 years will be a tall order of business." 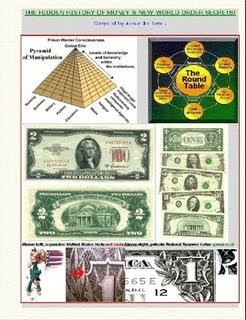 "The regional Federal Reserve banks are not government agencies. ...but are independent, privately owned and locally controlled corporations." The 'Federal Reserve' is not federal and has unproven reserves. It is a private, for Profit Corporation. The majority owners are the trans-Atlantic Illuminati Bank Lords. Look in the phone book of any city that has a 'Reserve Bank' such as San Francisco and you find the 'Federal Reserve' is listed not in the Blue government pages, but in the White pages, usually opposite the listing for Federal Express. The name is a deception to lull the public into believing that it is actually run by their government, while the reality is that a group of European Trans-Atlantic nationals led by the Rothschild and Rockefeller dynasties has complete control of America's money supply. Also of note is the fact that America’s money was taken off the Gold Standard in 1933, on April 19th making America’s money completely FIAT, backed only by the government?s promise to tax you at WHATEVER rate is necessary to repay the loans on the bonds that it issues (It is noteworthy that April 19 was also the date of the failed TREASURY Dept. raid in Waco, Texas in 1993; The federal takedown of the organization known as the Covenant Sword and Arm of the Lord occurred on April 19, 1985. This was exactly 8 years prior to the infamous Massacre at Mount Carmel Waco). "Most Americans have no real understanding of the operation of the international money lenders. The accounts of the Federal Reserve System have never been fully audited. It operates outside the control of Congress and manipulates the credit of the United States." Face this fact: The Fourth Estate is morally bankrupt just like the corrupt politicians and financial leaders for which they incessantly praise. Society is then trained to like those the media promotes and to dislike those that are demonized. Look at Oklahoma City bomber Timothy McVeigh; the media made great efforts to tie him with local militias, at the same time downplaying the fact that he was an ex-soldier that participated in the first Iraq Genocide. On the subject of patriots, the Battle of Lexington, which was the start of the War of Independence, commenced on April 19, 1775. The war was NOT fought due to high taxes on tea as you have been taught. It was fought for the reason of England passing a law preventing the Colonies from printing their own money (Colonial Scrip) which was interest & debt free and forcing the colonists to accept the English banker’s “debt money” system through armed force backed by fraudulent legislation. Sounds familiar? Now, let’s go into some details on these startling discoveries! What was the messiah Yeshua-Joshua (Yeshua/Issa) talking about? When he said around 30 BC or so “Yeshua-Joshua-Yeshua had quite a verbal scathing for the Pharisees (the priest-bankers-usurers who worked from the Temple in Jerusalem) who mislead ordinary Jews in Matthew 23. He exposed them for the sort of people they were: "Hypocrites," "sons of hell," "blind guides," "fools," "full of robbery and self-indulgence," "whitewashed tombs...full of dead men's bones and all uncleanness," "full of hypocrisy and lawlessness," "partners with them in shedding the blood of the prophets," and "serpents and brood of vipers." Since Ancient Roman and Babylonian times usury - the lending of wealth at interest - has been one of the main causes of war and empire building. Nations such as Persia and Rome became great due to their massive debts incurred by borrowing money from wealthy nations. Later, unable to return the wealth, but rich and with great armies funded by this borrowed wealth, they soon realised a need to conquer these lending nations in order to nullify their debts. This was also the reason for the introduction of taxes, a global system which is in use right up to today. Today, most of the taxes go to pay the interest to the privately owned central banks whose owners created money out of nothing to lend to the governments. Another city that would play a major part in being a financial choke point for the World was established as The city of Londinium (The Crown) by the Romans on the north bank of the River Thames in around 50 AC. To this day, the financial square mile is run by the Bank of England (remember Bank Street). "As lending upon interest was forbidden by the Gabinian law between provincials and Roman citizens, and the latter at that time had all the money of the globe in their hands, there was a necessity for tempting them with the bait of extravagant interest, to the end that the avaricious might thus lose sight of the danger of losing their money. And as they were men of great power in Rome, who awed the magistrates and overruled the laws, they were emboldened to lend, and to extort great usury. Hence the provinces were successively ravaged by every one who had any credit in Rome: and as each governor, at entering upon his province, published his edict wherein he fixed the rate of interest in what manner he pleased, the legislature played into the hands of avarice, and the latter served the mean purposes of the legislator"
"As soon as lending upon interest was forbidden at Rome, they contrived all sort of means to elude the law; and as their allies, and the Latins, were not subject to the civil laws of the Romans, they employed a Latin, or an ally, to lend his name, and personate the creditor. The law, therefore, had only subjected the creditors to a matter of form, and the public were not relieved". England’s King Edward VI (1547-1553) outlawed usury by Parliamentary decree. His reign was cut short because he opposed the moneylenders. Later King James was murdered and King Charles I was beheaded and finally, the private Bank of England was chartered in 1694. After the Battle of Waterloo, the Rothschilds managed to take ownership of the Bank of England from its former private owners. Thomas Jefferson: "... we must not let our rulers load us with perpetual debt...If we run into such debts as that we must be taxed in our meat and in our drink, in our necessities and comforts, in our labors and in our amusements, for our callings and our creeds...our people...must come to labor 16 hours in the 24, give the earnings of 15 of these to the government for their debts and daily expenses; and the 16th being insufficient to afford us bread, . . . We have no time to think, no means of calling the mis-managers to account; but be glad to obtain subsistence by hiring ourselves, to rivet their chains on the necks of our fellow sufferers. Our land holders, too . . . retaining indeed the title and stewardship of estates called theirs, but held really in trust for the treasury, . . . this is the tendency of all human governments. A departure from principle becomes a precedent for a second; that second for a third; and so on, till the bulk of society is reduced to mere automatons of misery, to have no sensibilities left but for sinning and suffering...And the fore horse of this frightful team is public debt. Taxation follows that, and in it's train, wretchedness and oppression." "The Colonies would gladly have borne the little tax on tea and other matters, had it not been that England took away from the Colonies their money, which created unemployment and dis-satisfaction." (In a conciliatory letter to a friend after the American Revolution, "Bulletin", February 1989 & November 1991 issues, P.O. Box 986, Ft. Collins, CO 80522). Instead of the interest free notes they issued as evidence of debt to each other, and which they used as a currency which will never multiply debt in proportion to the circulation, the colonists were required to use notes issued by the Bank of England on which they were required to pay interest. Franklin reported, "Within a year, the poor houses were filled. The hungry and homeless walked the streets everywhere." "YOU ARE A DEN OF VIPERS AND THIEVES. I INTEND TO ROUT YOU OUT, AND BY THE ETERNAL GOD I WILL ROUT YOU OUT." President Abraham Lincoln approached the banksters in order to finance the war. They wanted usury of 28%. Lincoln refused to pay. In order to circumvent the banksters he issued $450,000,000 in GREENBACKS or U.S. Notes. These GREENBACKS were non usury paying notes and were backed by the credit of the nation. Of course the banksters were furious. Had President Lincoln lived and finished out his 2nd term he would have forever closed the door to the malicious influence of the "Bank" of Rome. On April 15, 1865, he fell a victim to the leaden bullet of the assassin John Wilkes Booth another tool of the moneylenders!! In fact, 6 US presidents (William Henry Harrison, poisoned, in 1841, Zachary Taylor, Lincoln, Garfield, McKinley and John F. Kennedy 1963; 7 if we count FDR’s poisoning) were murdered because of their opposition to private central banks who can create interest-bearing money from nothing. "Among the early experiences that were helpful to me that I recollect with pleasure was one in working a few days for a neighbour in digging potatoes a very enterprising, thrifty farmer, who could dig a great many potatoes. I was a boy of perhaps thirteen or fourteen years of age, and it kept me very busy from morning until night. It was a ten-hour day. And as I was saving these little sums I soon learned that I could get as much interest for fifty dollars loaned at seven per cent. - the legal rate in the state of New York at that time for a year as I could earn by digging potatoes for 100 days. The impression was gaining ground with me that it was a good thing to let the money be my slave and not make myself a slave to money" (Ida Tarbell, History of the Standard Oil Co., p.41).